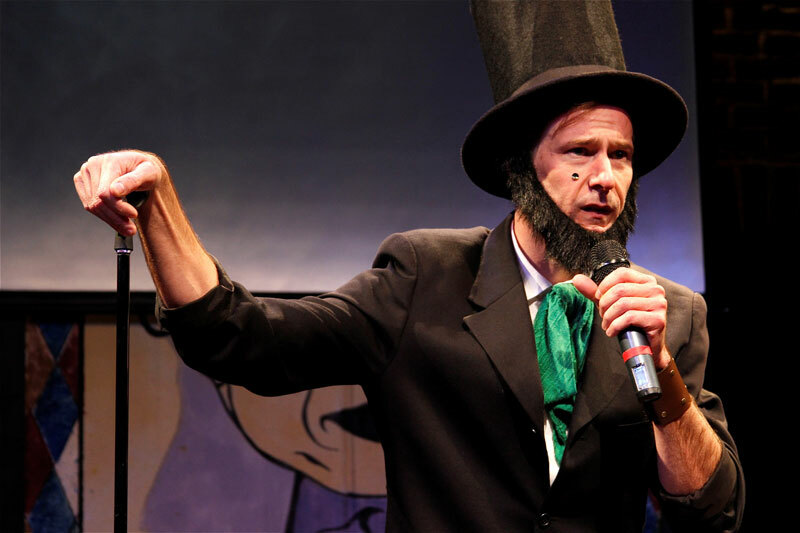 Dominic Conti as Abraham Lincoln in the Reduced Shakespeare Company production of The Complete History of Comedy (abridged). Photo by Sandy Underwood. Used by permission. Regular readers of this blog know well that Abraham Lincoln was devoted to Shakespeare. But did you know that America’s 16th president also invented stand-up comedy? It’s true! This is top-drawer observational comedy of the kind we’ve seen practiced by standup comedians for decades. Lincoln’s wit served him well in the legislature, out on the lawyer circuit, and in political debate, combining reflection with self-deprecation, a combination that Shakespeare used extensively. As funny as Lincoln was, it’s worth noting that he doesn’t list any of Shakespeare’s comedies as his favorites. Perhaps he loved the comedy of contrasts, in which a comic line or witty observation packs more punch against the backdrop of a serious or tragic tale. Perhaps, as he was writing to a famous tragedian, Lincoln reckoned that mentioning a comedy was below them both. Perhaps he found existential struggle amusing, or at least instructive: As even an “unprofessional reader” would have noticed, many of Shakespeare’s heroes spend entire monologues agonizing over options available to them, analyzing the pros and cons of whatever situation they’re in, while frequently confessing to sins or admitting to failures they share only with the audience. Even Iago and Richard III, two of Shakespeare’s greatest villains, achieve a strong connection to the audience through their self-deprecating and witty charm. King Lear stands out in Lincoln’s list of Shakespeare’s plays because the character of Lear has the fewest monologues of any of Shakespeare’s title roles. But for that sort of personal analysis, Lear had his Fool, the one person in a monarch’s court whose job it is to tell truth to power, who can be reflective and honest when the king refuses to be. We might think of the Fool as a traditional jester garbed in cap and bells, but in a way he’s more akin to how Adrian Scarborough played the character in the 2014 National Theatre production, as a mate of the King’s, a longtime colleague who could tell the King the truth as he saw it, sometimes camouflaged with wit and humor but not always. Lincoln had no Fool. Or, to put it another way, Lincoln was his own Fool. When he was criticized for being two-faced, Lincoln famously responded by saying, “If I were two-faced, would I be wearing this one?” By being so self-deprecating, Lincoln was able to disarm his critics, taking away their power by acknowledging his own human failings. Lincoln didn’t tell truth to power, he told truth to himself. In fact, one can imagine Abraham Lincoln happily quoting Jaques in As You Like It — “I was seeking for a fool when I found you” — every morning while looking in a mirror.